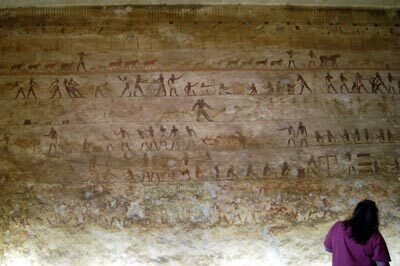 THere are a number of murals in the tomb, including papyrus gathering and a desert hunt. 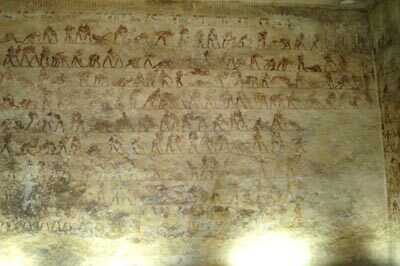 The rear wall shows 200 wresting positions in many registers, and the south wall shows the officials of Baqet punishing people who hae evaded taxes. The quality fo the scenes is very high, much better than those of his son, Kheti. The most lifelike of the wrestling scenes are shown here; they are very detailed and accurate. 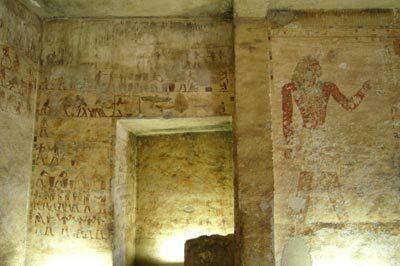 THere are many burial shafts in the tomb, along each wall. It is likely that many family members were eentually buried in the the tomb with him.